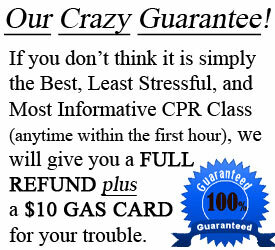 CPR Nashville provides the Best, Stress–Free ACLS Class in Nashville – Guaranteed or your money back! We believe that creating a relaxed and friendly learning environment, along with experienced American Heart Association instructors and small class size, allows for tailored learning for individual skill sets and expertise. In this ACLS course you will renew your advanced life support skills such as managing airways, IV’s, ECG’s and emergency pharmacology. Our instructors will take you through a Stress-Free Megacode at the end of class that will enable you to synthesize all the information into one culminating and useful experience. Our Goal is to Help You Succeed! Renew Now! Hands-On, Relaxed, and Stress-Free. -Relaxed, Stress-Free Megacode and Testing! -Be Worry Free for 2 more years starting today! -Avoid Online Classes! Forget about spending an entire frustrating day sitting in front of your computer with a boring Online Course that will still require you to take an in-person skills test to get your AHA provider card. 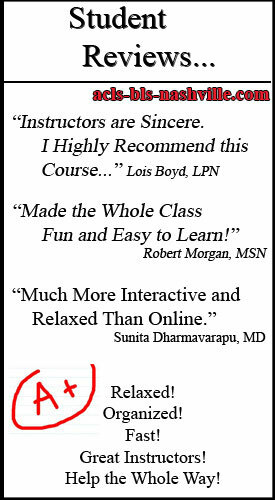 -Your Success is the focus of our AHA Instructors. -BEST ACLS CLASS! – or your money back! –GET CARD – DAY OF CLASS! Click on a CLASS in the CALENDAR BELOW. CPR Nashville’s ACLS instructors are American Heart Association (AHA) certified to teach Advanced Cardiac Life Support, as well as Basic Life Support courses. 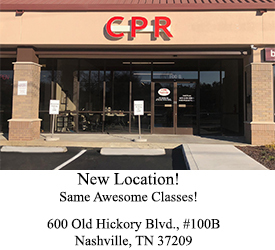 Each instructor must first become certified through comprehensive course instruction with the AHA, then each instructor is further trained by CPR Nashville in order to insure that the proper classroom environment is being maintained at all times. We want you to feel relaxed, comfortable and confident each step of the way during the renewal process. We know the ACLS Megacode can be quite intimidating at times. But, rest assured that our team is well versed in making the entire process as stress-free as possible. We will help you be successful. The skills you learn in this class will help save lives, and we take the responsibility of making sure you maximize your learning of all the material very seriously. 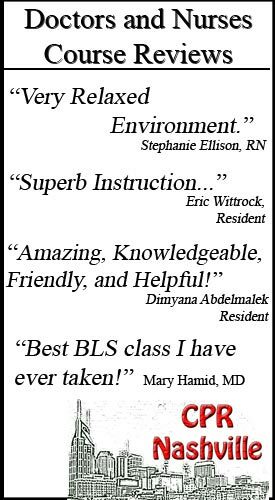 As a healthcare professional you are very important to our community, and we want to make sure that you receive the best training possible in the best learning environment that can be created. 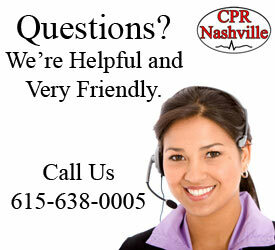 If you have any questions, please call us at 615-638-0005 or email us at info@acls-bls-nashville.com. © 2012 BLS-ACLS-PALS Classes, Nashville | AHA CPR Classes All rights reserved.